UPM Raflatac is a leading global supplier of pressure sensitive labeling solutions. Our self-adhesive label materials are used for product and information labeling across a wide range of end-uses from wine & spirits, craft beverage, security to pharmaceutical applications. Each product is designed to offer excellent printability, convertibility and durability in the latest labeling machinery. We manage 11 factories and a wide network of sales offices and distribution terminals worldwide. Our parent company is UPM The Biofore Company. In today's world, it's all about the brand. Our extensive range of label materials for the wine, spirits and craft beverage markets provide the perfect canvas to help creative designers bring their most intricate, attractive designs to life. Whether you're looking for coated, uncoated, textured and metallized papers or film options, we have everything you need to compete for premium space on crowded retail shelves. Find your inspiration; we have the solution. At UPM Raflatac, we have a proud legacy of fruitful partnerships in the wine, spirits and craft beverage industries. Our goal is to continue this tradition by helping you choose from a wide range of materials designed to bring out the best in your label. All of our label stock products have been developed to work effectively with a variety of printing and converting techniques, with adhesives and liners to suit all conditions. And our materials constructed with FSC® certified face papers and recycled content help support sustainability targets throughout the value chain. Although, they're all unique, our label materials do share one thing in common. Each is guaranteed to give your product a powerful edge. Image shows the vast array of products that we have available for several end-uses. UPM Raflatac is labeling a smarter future by unleashing the potential in people and businesses to seize new opportunities and take actions towards more sustainable choices. Since the 1970s, we have used our expertise to help a world of brands express themselves and stand out. Labels are a part of millions of people’s lives every day and therefore labels matter. Green Man Brewery and UPM Raflatac form a partnership to solve production challenges stemming from poor material performance. Learn how our new Silvervac WSA face stock maintains label design integrity – even in the challenging conditions of an ice bucket. When bottles featuring these labels are placed in an icy bath, brands continue to shine as brightly in the ice bucket or cooler as they do on the shelf. A brief educational video from UPM Raflatac that features tips about how to apply thin films from our Market Development Manager, Trevor Richardson. We are driven by innovation and sustainability. Contact us today to find out how we can help you leave a mark and build your legacy. How are you meeting your sustainability targets? Check out this link and watch the video and to find out how you can partner with the world's most sustainable label company! Just like the finest wines, spirits and craft beverages, the best labels are born of a passion for creating experiences that live long in the memory – and making a brand stand out on a crowded shelf is a true art. The label is the calling card; a first taste of the delights within. We are UPM Raflatac – a global manufacturer of pressure sensitive label materials. With our huge range of label materials, the possibilities are endless – our materials offer brands the freedom to unleash the creativity to tell an engaging story that bridges the gap between product and consumer. We'd love to see you at booth 518 in the Hall of Flowers! Visit our page in the WIN Expo Guide to learn more! Wineries around the world trust UPM Raflatac labeling solutions to reflect the spirit of their brand and tell its story to consumers, with shelf appeal that translates into increased visibility and sales. Our extensive knowledge of the wine market and trusted cooperation with brand owners goes back decades, while our broad and inspirational product range means we have a perfect solution for every wine story. In our wine case studies you can read about how we’ve helped some of the world’s leading wine producers fully express their brand promise. In one case, premier Italian wine producer and exporter Zonin1821 wanted to create a range of fine Chilean wines with distinctive Italian characteristics. To communicate both their expertise in Italian wine production and the contemporary spirit of Chilean wine, the company turned to UPM Raflatac’s innovative and inspirational range of wine labeling materials for their Dos Almas wines. As part of its commitment to combining world class service with a local touch, UPM Raflatac is pleased to announce that it has expanded its popular Small Roll Service to now include standard and welded wine stocks. Our Small Roll Service is available to all of North America with swift turnaround times and the flexibility to purchase one roll or many rolls with each order. This enables printers and converters to effectively meet the needs of their customers without over-ordering label materials to meet minimums. "This program is designed to support your short run labeling needs," says Amy Jensen, Director, Specials, Americas, UPM Raflatac. "At UPM Raflatac, we are always looking for new opportunities to expand our service offering of the highest quality label materials on the market, and now with the addition of these wine materials to our Small Roll Service program, our company is even better equipped to meet the needs of printers and brand owners in North America." We are always available to answer your questions regarding label materials and solutions. Please contact americas.support@upmraflatac.com to get in touch with our wine label solutions experts. Every winery has a story to tell as unique as the wines it bottles. But, with more wineries in the Eastern U.S. and Canada than ever before, standing tall among the competition has never been more difficult. And the label material a winery uses is key in catching the consumer's eye. UPM Raflatac, one of the global leaders in the production of wine label materials, is pleased to announce it will be bringing its wine experts to the Eastern Winery Exposition in Lancaster, Pennsylvania from March 6-8. Winemakers and wine industry professionals are invited to stop by UPM Raflatac's set-up at booth 173 in the Lancaster County Convention Center to learn more about what the company's wine label materials can do to distinguish wine brands. Samples of wine label materials will be available as well. "UPM Raflatac has found tremendous success in leading wine markets around the world, including France, Italy and right here in the U.S. in California, and we are ready to share our expertise with you," says Jean Willson, Segment Manager, Wine, Spirits, & Craft Beverage, Americas, UPM Raflatac. "We are passionate about making high quality label materials to help your products command attention on the shelf." Come visit UPM Raflatac's experts at booth 173 of the Eastern Winery Exposition to learn first-hand how they're labeling a smarter future for the wine industry. Please click here for more information about UPM Raflatac's wine label solutions. The Pentawards, the most internationally respected competition exclusively dedicated to packaging design, has unveiled UPM Raflatac as its latest big name sponsor. This is a major coup for The Pentawards, coming shortly after it announced that its hotly anticipated Gala Ceremony will be held at the Guggenheim Museum, on 6th September 2018. UPM Raflatac is one of the leading global suppliers of sustainable high-quality, high-performance pressure sensitive label materials. As the latest sponsor of The Pentawards it will be joining a series of major names, which includes Esko, Sleever and IC3D for 2018. As part of the sponsorship agreement, UPM Raflatac will present one of the awards – The Beverage Category - at the Pentawards Gala Ceremony, taking place in New York later in the year. UPM Raflatac will also host a panel discussion at the Pentawards Conference in Madrid, and will support the global tour of the Pentawards in the form of their Winner’s Exhibit. The Pentawards attracts packaging from around the world, which is then judged by an international jury of 12 highly respected designers, packaging design directors and marketing chiefs. New for 2018, The Pentawards has launched a new ‘Sustainable Design' category, to recognise those designers, brands and manufacturers who are working hard to create innovative sustainable solutions that optimise the environmental performance of their packaging. This category is open to all projects, taking pack structure, materials used and production methods in consideration. UPM Raflatac is pleased to announce that its new labelstock slitting and distribution terminal in Santiago, Chile has officially opened. A grand opening event at the facility complete with a ribbon cutting ceremony marked the occasion on the evening of January 10. This new terminal allows UPM Raflatac to expand its customer reach and improve its service capabilities by offering an expanded range of innovative and sustainable paper, film and specials products – particularly in the wine and craft beverage segments – to customers in the Chilean and surrounding markets including Argentina, Bolivia, Paraguay and Peru. The facility features two meter-wide slitting capabilities and UPM Raflatac also has trimless offerings on selected materials. UPM Raflatac is a forerunner in sustainability and we work hard to reduce the environmental impact of our products. As part of our paper product portfolio, we offer sustainable solutions, such as our ENVI® PCW100 WSA label materials. Featuring an FSC®-certified face paper constructed with 100% post-consumer waste, these products help support sustainability targets throughout the value chain and provide excellent wet strength on bottles. The raw materials for all of our FSC® and PEFC™-certified paper-based products are sourced from certified, responsibly managed forests – which is your guarantee that the wood materials originate from sustainable and legal sources. On the films side, we are introducing thinner and lighter PP and PET products to help reduce the environmental burden while maintaining optimal technical performance and maximum shelf appeal. Additionally, our washable adhesives for the wine industry help increase bottle recyclability. Although they’re all unique, all of our label stocks do share one thing in common. Each one is guaranteed to give your products a powerful edge. Raise a glass to beverage labels! The beverage industry is known for its exceptional branding and marketing. So it’s no surprise that the demand for eye-catching options for bottles, cans and other beverage containers is continuously on the rise. In terms of decoration technologies, pressure sensitive labels help communicate a brand’s story, providing a graphic canvas that both shows and tells a company’s commitment to artisanship. Beer and cider labels have long been a standard for innovation, adopting ultra-thin film labels and liners. Other beverage manufacturers are following suit, adopting downgauged labeling solutions that convey quality, while delivering increased productivity and cost savings. Whatever the approach, self-adhesive labels are a powerful tool for both global manufacturers and boutique beverage companies alike, as these materials offer endless opportunities for customization. Learn more about how our pressure sensitive beverage labeling solutions are designed to help differentiate your brand on the retail shelf! Urban Chestnut’s brand is about urban sustainability. Its two locations in downtown Saint Louis are partially powered by solar panels; reuse water for cooling; and are LEED-certified. Although they primarily distribute in the Midwest market, Urban Chestnut has since expanded overseas, buying a brewery in Bavaria. As industry experts, Kuplent and Wolfe wanted to work with partners who would provide a high-quality, exceptional packaging solution that would meet their brand business growth objectives. 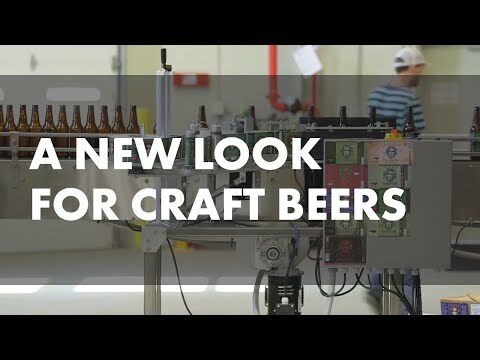 Green Man Brewery, one of Asheville, NC's leading breweries, experimented with different packaging strategies, including wet cold glue application for small batches and off-site bottling, before gearing up for production in-house. With all the media hoopla over craft beer, it's easy to forget that original adopters like Green Man Brewery had to chart their own path. Green Man Brewery didn't have the options available to brewery owners today, such as portable packing lines, mobile canning, transparent and ultra-thin film label stocks and digital printing. Visit us at Pack Expo International 2016! A perfect fit for packaging decoration! At this year's Pack Expo International, UPM Raflatac's team of experts will guide you through step-by-step demonstration of how a true value chain collaboration can help packaging companies find new ways to distinguish their brands and capture consumer attention at the point of sale. Visit us at Booth N6275 in the Containers and Materials Pavilion and discover how our standard and custom labeling solutions are a perfect fit for the world of packaging decoration, from sustainability and efficiency to design and functionality. And don't miss us on the Innovation Stage where Mr. Trevor Richardson, our Business Development Manager for the home & personal care and beverage segments, discusses the latest on-pack promotional trends for food, beverage and personal care packaging as well as the opportunities that ultra-thin, clear pressure sensitive film labels, like VANISH™ can bring to your business. Springfield Brewing Company, based in Springfield, Missouri, is a pioneer in the craft beer industry. The company opened its doors in 1997 as part of the revitalization of downtown Springfield. In 2011, Ashton Lewis, Master Brewer; Bryan Bevel, Operations Manager; and several others purchased the brewery from The Paul Mueller Company, and the business took off! Bryan Bevel now oversees an operation that has grown to encompass 94 employees and a product portfolio of seven beers. Find your inspiration; we have the solution. If you’re looking to help your customers take their wine, spirits and craft beverage labels to the next level, look no further than UPM Raflatac. We offer an extensive range of label materials designed to provide the perfect canvas for a customized, one-of-a-kind product experience. With personalized labels, beverage companies have the unique opportunity build a deeper connection to consumers by tailoring their wine, spirits and craft brew imagery to a target consumer audience – and build brand loyalty when they design and print labels that feature a personal touch. Our pressure sensitive label stocks are the ideal foundation for the rapidly expanding trends of customization and personalization in the wine, spirits and craft beverage segments. When you print designs and convert our paper and film stocks into personalized labels for your partners, the benefits range from low-cost application, to the ability to easily and change parts, to enhanced design capabilities (especially with clear films) and digital printability. Don’t hesitate to take advantage of the knowledge of our team of Label Experts, who are readily available to provide you with targeted support and expertise – and help you find the right products for your printing and converting needs. After all, what’s more personal than a consumer’s name on a bottle or can? See how our value chain supports craft breweries like Mother’s Brewing Company! If you visited our booth at the 2016 Craft Brewers Conference and BrewExpo America, you might remember those red labeled cans we had on display as proof of our solution to the pre-printed can dilemma. But even if you missed us, we’re pleased to announce that we’ve partnered with several members of the mobile canning value chain to develop our new, highly-informative eBook. Within its pages, you will find details about innovative labeling and packaging solutions for the craft beverage industry designed to combat the issue of high minimum order quantities of pre-printed cans and help breweries more easily manage multiple SKUs, seasonal brews – and more! Request a copy of our eBook to learn why craft beer manufacturers are “can do” about mobile canning! When it comes to labeling, the difference between black paper stocks is like night and day. UPM Raflatac’s Eclipse Black™ has a midnight hue that leaves no room for compromise – or printing surprises. The elegant Eclipse Black™ is shutting down the competition, as renowned vintners decide to go black label for their award-winning wines. This premium ultra-black paper provides a stark visual palette that opens up a world of colorful branding opportunities. Imagery and text pop on this super smooth 60# paper face. And consumers, dazzled by brand owners’ commitment to quality, are filling their shopping carts with Eclipse Black™-labeled premium wines. The Eclipse Black™ product construction is also a real sustainability pro with a face stock that’s comprised of 30% post-consumer waste and a recyclable PET liner. With its unique wet strength properties, our new Silvervac WSA face stock maintains label design integrity – even in the challenging conditions of an ice bucket. When bottles featuring these labels are placed in an icy bath, brands continue to shine as brightly in the ice bucket or cooler as they do on the shelf, whereas labels with a non-wet strength metallic face stock crack, peel and begin to disintegrate. UPM Raflatac has partnered with several members of the mobile canning value chain to develop our new, highly-informative eBook. Within its pages, you will find details about innovative labeling and packaging solutions for the craft beverage industry.